I don't know what it is but within the last year or so I've become obsessed with everything that has sea salt in it, whether that be chocolate, caramel or whatever. 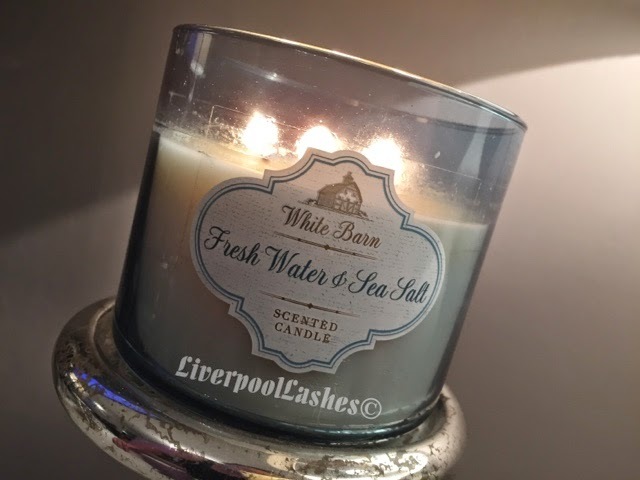 When I looked online before my visit to the States and saw that Bath & Body Works has a "Fresh Water & Sea Salt" candle, I was delighted and couldn't wait to pick it up. I like the colour and style of the packaging, I think it really suits the theme of the frangrance. I would say it smells like a vague clean linen scent mixed in with the freshness of sea salts. The scent itself is not incredibly strong when smelling directly from the candle, both lit and unlit. I actually purchased three of this candle as I was convinced I would adore it however having burnt through almost half of it already I can confirm that the scent just wasn't as strong as many others that Bath & Body Works do and therefore I wouldn't really recommend it.